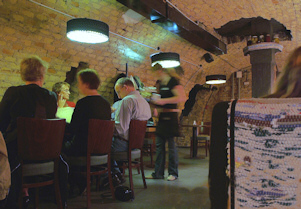 one of the themed restaurants in Vilnius. Gras’as is one of the several restaurants in Vilnius located on Vokieciu Street, which is one of the busiest streets in Vilnius Old Town and just a few minutes away from the Town Hall building. Its highlighted feature, the peculiar looking gnomes holding up the tables behind a glass wall, draws your attention as you pass by and fits in well with the Contemporary Art Museum next door. John and I intended to dine at one of the tables behind large windows looking out over the street, which is a great spot to watch the world go by, however some heavy staining on our intended bench marred our experience. It was a shame but not the end of the world really as they have about 7 cavernous dining areas downstairs. It was a Friday evening and the restaurant downstairs was busy and vibrant. 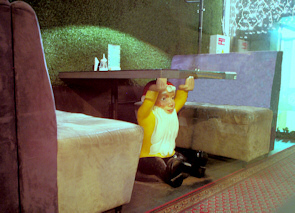 The decor is fun and quirky with colourful elfs, mock log tables and the ceiling is covered with grass. It has a relaxed but stylish feel to it. We chose to sit in the area that we called the ‘pickle room’ as it has pickle shape lampshades, pickle jars, and other pickle theme details. The service though was a little bit of a let down. It was slow due to being busy I suppose and it took about 20 min. just to recieve the menu. Hopefully that was just one off because I have always had a fairly pleasant experience there in the past. And I was in the mood for fried salmon, which came with rise and vegetables (6 €) It was pleasantly flavoured and in a rather generous portion. We were too full to have deserts but on the menu they have tempting choices of Cheesecake with mashed berry sauce at 4 € or Creme Brulee at 2 € to mention just a few. The restaurant usually features jazz music downstairs. 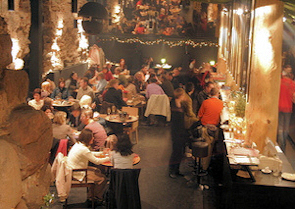 On weekends after your meal you can also go to Gras’as disco, or the nearby underground club Connect. Overall we had a lovely time as this is one of the restaurants in Vilnius that you usually leave satisfied and in high spirits. Open daily: 12:00 - 24:00, Fri - Sat 12:00 - 01:00, Sun closed.